We ask that you leave the base area no later than 45 minutes before the lifts actually open so that you can get up top before encountering skiers coming downhill. There will be times when skinning and hiking is closed due to weather conditions. Please check the snow report before proceeding. SNOWMAKING EQUIPMENT, WATER/POWER LINES, SNOWCATS, SNOW MACHINES, MOUNTAIN EQUIPMENT AND OTHER HAZARDS CAN BE ENCOUNTERED ANYWHERE AT ANYTIME ON THE MOUNTAIN, IN ANY SEASON. PLEASE USE EXTREME CAUTION WHEN ON THE MOUNTAIN. ALWAYS DISPLAY A LIGHT AND WEAR REFLECTIVE CLOTHING. WHEN ENCOUNTERING MOUNTAIN OPERATIONS STAFF AND VEHICLES, PLEASE MOVE OUT OF THE WAY AND STOP ANY UPHILL OR DOWNHILL ACTIVITY UNTIL THEY PASS BY. We do not provide emergency services outside of our regular hours of operation. Do not depend on rescue or ski patrol services in the offseason, during pre- or post-season, at night, or even mid-season if the mountain is not operating and the lifts are not running. In the event you are hurt be prepared for a lengthy time spent outdoors, preparing for your own self-rescue, and for your own personal first-aid. 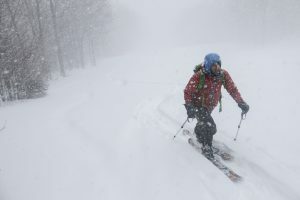 Recreating off-hours at MRG should be no different than other backcountry activity – potential rescue could take many hours and be complicated by weather, location, and availability of resources. Do not depend on others for assistance. Call 911 in the event of an emergency and know your location so that you can report it to the dispatcher. Plan your trip ahead of time and let others know where you’re going and when you’ll be back. Be aware of prior, current, and future weather conditions on the mountain – our weather can and does change with little to no notice. Equip yourself with proper food, fuel, light, and clothing in the event you are injured and need to spend more time outside in the elements than planned (even overnight). Don’t go it alone – groups of 3 are recommended so that in an emergency the injured can have 1 person provide first aid and 1 person to go get help. You are responsible for wearing bright reflective clothing and for displaying a light so you can be seen. Just as our vehicles are equipped with warning lights, you should equip yourself so that you are as visible as possible. Carry multiple/redundant forms of communication – cell phones do not always work, lose their charge, or malfunction in cold/wet environments. 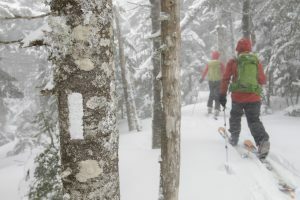 As with any backcountry ski plan, be sure to scout what you plan to ski. Go up what you plan to go down. Unknown and unseen hazards exist and ski conditions/obstacles can and do change quickly. Water bars, tree branches, rocks, and other hazards are present and may not be visible or apparent. Ski conservatively and on trails with which you are familiar and comfortable skiing in any condition. If you see a snow cat or snowmobile coming, don’t hide! Go the side of the trail and shine your light toward the snow cat. Operators want to know you’re there and see where you are. If the full width of the trail isn’t groomed, you should expect snow cats to return once they’ve gone by you. Make sure that you are able to step to the side of the trail if they return. NEVER follow a snow cat down the mountain. Even the best skier can catch an edge and fall – and you don’t want to come in contact with a snow cat. Snowmaking equipment can pose serious hazards in addition to the ones described above. Snowmaking snow may be wet and heavy, and snow may not be consistent from gun to gun. We also may have long hoses stretched between our movable guns and fixed hydrants. STAY AWAY. Do not ski on or over any hoses, lines, or equipment! These hoses contain high-pressure water and electricity and skiing over them is extremely dangerous. STAY AWAY FROM ALL SNOWMAKING EQUIPMENT. Dogs are not allowed on the mountain – please leave them at home. If you’re parking in the main parking lot on Rt. 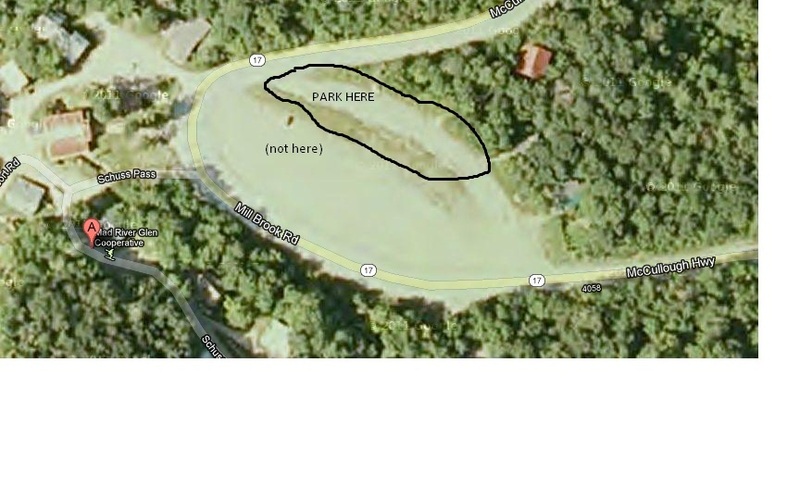 17 during off hours for dawn/dusk patrol, please park in the location indicated on this map. This will help mountain staff plow the main lot and park cars efficiently while you earn your turns. Thanks – your help is greatly appreciated!